Hiya guys. My best friend Cheyenne of CDBNails and I are once again coming at'cha with the Bestie Twin Nail Challenge! This is week two of the challenge and it was my turn to pick out a design for us to create. I was driving myself crazy thinking of what to do and then it hit me. Or honestly I was eating a watermelon as I browsed Instagram and thought 'hey, this could work!'. 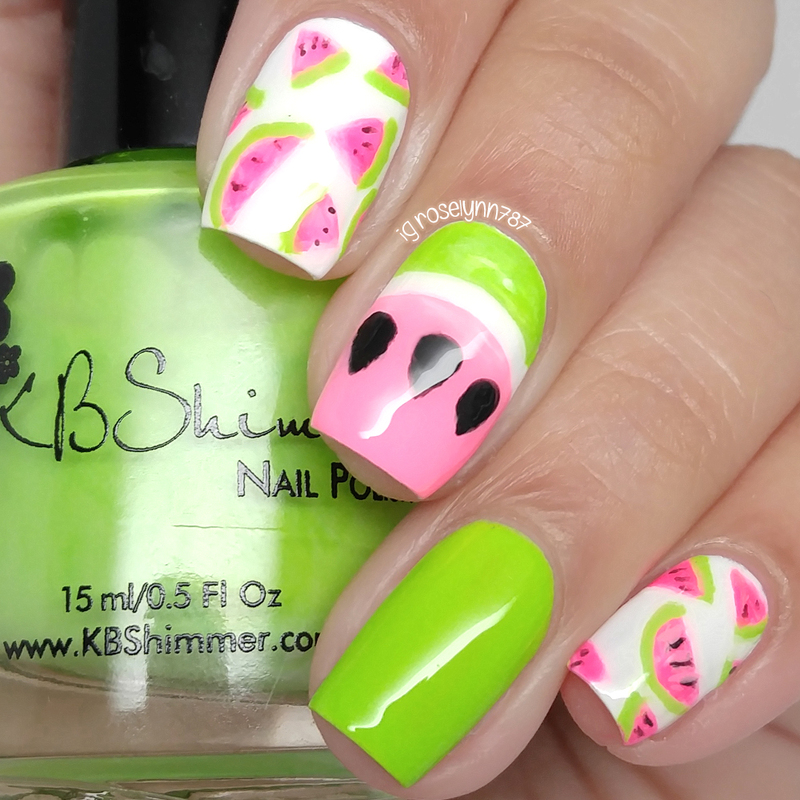 So here's our super bright and fun watermelon mani inspired by the talented Oh My Gosh Polish. Summer, summer, summer time time to sit back and unwind. Haha. Now that's a throwback, if you don't know that song well then... I feel super old. And okay, it's not summer yet! But I am prepping for it early because somehow it's spring and still cold. I'm ready to put my sweatshirt away mother-nature, kthx. Anyone else now craving a watermelon? There are bits missing in my video (due to trying to edit in a rush), but the seeds for the middle nails are done by using a dotting tool for the base point. Then using a brush drag the sides and create a tear-drop shape. If it comes out a little wonky, don't worry just use the pink and shape it as needed. And there is a quick video for you guys too. Thank you so much for subscribing, I've reached over 300 subs this past week and I'm ecstatic! From the bottom of my heart, thank you! I really wish I could of done a voice-over with the video, especially because this challenge means so much to me. Unfortunately Windows 10 decided to come up and destroy my editing software. I'm not giving up hope though and am currently learning how to use a different compatible program. Fingers crossed for me and if you have any suggestions for software let me know! Isn't it almost like identical?! I feel like we are so completely in sync with this mani, both in the art and in nail shape. I feel like we're going to slowly be stepping up the challenges as each week goes by and I am so nervous/excited. Cheyenne is a beast when it comes to freehand so... *rolls up sleeves* bring it on! Haha. See you guys next time at our next challenge coming in two weeks. Ohhh they are identical! I love them, they give me summer feels :D And that green! Whoa! I love these and they make me wish Summer was already here! These are too adorable! The both of you did an amazing job! So much fun, I love that neon green! You guys KILLED this. I wouldn't be able to tell these were different without this post. Those are beyond adorable, congrats on 300 subbies! 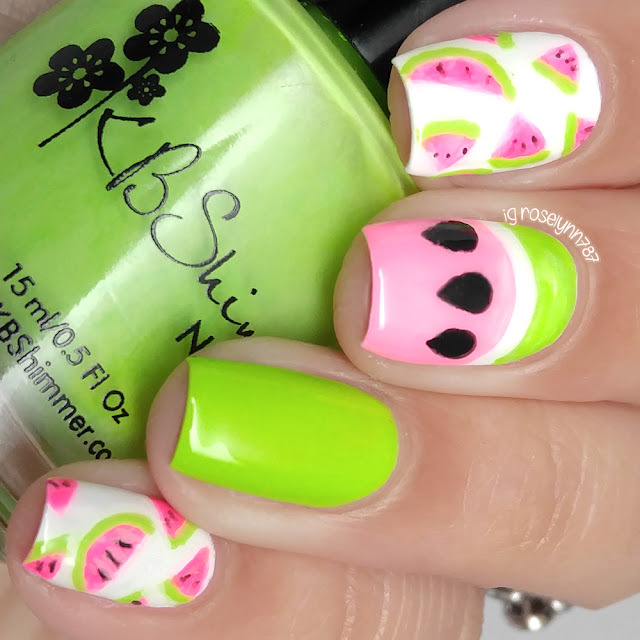 Not only am I now craving a watermelon, but I'm also whishing for it to be Summer already! Super cute manicures here, watermelon nails are always a win to me! This is beautiful! I am putting watermelon on my shopping list now. How cute! This is so perfect for summer! I'll have to remember this idea! These are great! Really could use some watermelon right about now!